Apple retail stores on the east coast opened Tuesday with no stock of the new Retina display-equipped iPad mini following its surprise early morning launch, with staff recommending that customers purchase the tablet online. Update: The "Personal Pickup" option has gone live on Apple's online store, and many of the company's retail storefronts indicate the tablet is available now for customers who wish to purchase online and pick up in person, rather than wait for shipping. Spot checks of Apple retail stores in the eastern time zone indicate that the company has not yet seeded its first-party retail network with supplies of the hotly anticipated slate. Employees at some stores told AppleInsider that they did not know when inventory would arrive and recommended ordering online as the quickest way to obtain a device, while others suggested that stock will arrive in the next few days. 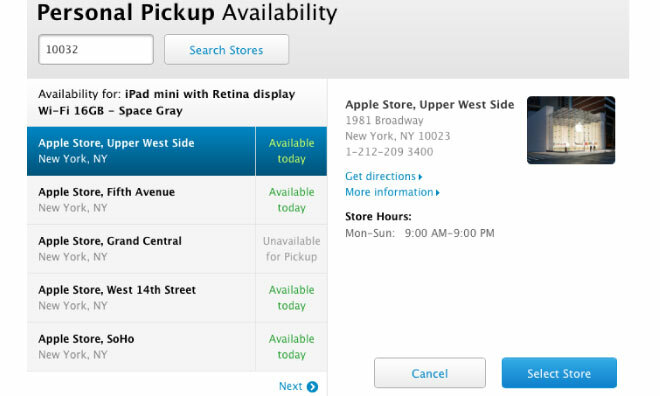 When the new iPad mini does makes its way to stores, it will only be available via Apple's "Personal Pickup" service. Customers will need to buy the tablet at Apple.com, then pick up the reserved unit at their local Apple store. It is possible that Apple retail stores will receive initial stock of the device later this afternoon, and AppleInsider will update this article throughout the day as retail outlets in the central United States and on the west coast open their doors. Apple opened online sales of the new iPad mini early Tuesday morning, catching consumers and media alike off guard. Cupertino has previously indicated that supplies of the thin and light high-resolution tablet will be constrained, with CEO Tim Cook saying that it was "unclear" whether the company could meet demand for the device over the busy holiday season.